Qigu “Sy” Jiang was born in Shanghai in 1956. He received his Bachelor of Fine Arts degree from Shanghai Normal University in 1983 and his Master of Fine Arts degree from the School of the Art Institute of Chicago in 1990. 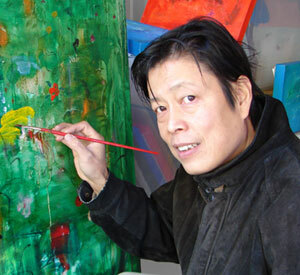 In addition to maintaining a full schedule of gallery showings in the United States and abroad, Mr. Jiang is also an adjunct Associate Professor of Art in the Department of Painting and Drawing as well as the Department of Art History, Theory and Criticism in the School of the Art Institute of Chicago. The following essay, “Painting Both Indispensable and Mundane: The New Work of Sy Jiang,” was written by Kathryn Hixson for a gallery opening in Chicago. The paintings of Sy Jiang are exemplary of the fusion of multicultural influences – new amalgamations of philosophies, styles and social concerns – which has enlivened contemporary artmaking. Jiang breathes new life into traditional representational painting, layering forms within vibrant abstract fields of saturated brushwork. Drawing upon his own remarkable diverse experience in China and the United States, he offers a unique vision that reveals both the unlimited possibilities offered by the meeting of cultures, and the anxieties produced by alienating dislocation. Born in 1956 and raised in Shanghai, Jiang was exposed to the evolving cultural politics of China, which alternately courted diverse western influence, and expelled and repressed contemporary ideas. Information of Chinese artistic heritage was controlled and that of non-Chinese cultures was scant. At the Shanghai Teacher’s University, Jiang was schooled in the official style of social realism, mastering the representational mode of painting regularly employed for cultural propaganda. When he employed this style to express his own political and philosophical views, he was perfunctorily transferred to a different schedule of courses concerned with the more aesthetic, less politicized, study of traditional Chinese ink brush painting. Though suffering the repression of the Cultural Revolution, Jiang developed his skills within the given terrain of Chinese tradition. Upon arrival in Chicago in 1987, Jiang was deluged with a vast amount of artistic information in museums, galleries, and schools. Coming to attend the School of the Art Institute, he wished to take advantage of the opportunities for artistic development offered by this prestigious academy. From stately European masters, Impressionists, Expressionists, American Abstract Expressionists, Surrealists, Chicago Imagists, to the latest post-modern diatribe, Jiang consumed the great Western aesthetic and philosophical traditions. He was able to engage in a personal dialogue with the original artwork, which had been available to him prior only via reproductions. In his recent work, Jiang interweaves a Chinese heritage with his new vital experience of the fresh cacophony of urban America and the invigorating tumultuous western art world. Jiang covers his canvasses with layers of intensely hued brush strokes, creating overall fields of red, blue, white, and yellow. Similar to the surfaces of Abstract Expressionists such as de Kooning, and reminiscent of works by Hans Hoffman and Philip Guston, Jiang’s grounds invite penetration and give the illusion of special depth. The viewer’s eye can delve into the lively field of brushstrokes, which vary in thickness, hue, direction and saturation. Areas of reflective varnish interact with sections of matte finish, further articulating the complexity and vitality of the abstract space of the honest, unframed canvas. The artist’s delicate touch is forcefully evident, and the paintings, again in the Abstract Expressionist tradition, serve as vestiges, records of the process of making – a reverie between artist and material. Floating over these rich fields are monochrome images of mundane fruit, vegetables, flowers, and plants. Drawing on his mastery of Chinese brush painting, Jiang juxtaposes these familiar images with the color fields in a way that equates the illusory space of the abstraction with the pictorial precision of the representational. Within a post-modernist dialogue, Jiang avoids confining himself to the given vocabularies of traditional styles, and presents a skeptical analysis of painting’s assumed authority to be either an opaque imitation of nature, or a formal autonomous being. Jiang, however, transcends this Western skepticism. His ferns, blossoms, peppers, and tomatoes, hover on the surfaces of the paintings as fragmented, dispossessed specters of themselves – appearing as ordinary things appear in dreams. The objects, flattened by their monotonal rendering, interact with the spatial complexity of the backgrounds similar to the way in which, in Chinese poetry, the mundane is glorifies and heavenly ideal is rendered commonplace. By privileging the ordinary, Jiang joins in the Eastern tradition of finding miraculous energies on the universe in everyday occurrences. In the contemporary emptiness of art, and painting in particular, Jiang has discovered a place for meditation. His nebulous area of brushstrokes and illusory space – that invites contemplation – is not an ambiguous freedom, but is an atmosphere fraught with a troublesome uneasiness. His dispersed colors and looming objects refuse to easily coalesce into comfortable compositions. The paintings become meditative spaces that simultaneously offer the solace of familiar traditions, while exposing the uncertainties spawned by the jarring juxtapositions of the quite diverse traditions. Within his expert facility of aesthetic tradition, Jiang’s paintings are eloquent assertions of assimilation without violence: intricate fusions that retain the misgivings, profundities and the beauty of the shared cultures, and of the individual personality through which they continue to live.